Acrylic Pad. A3. 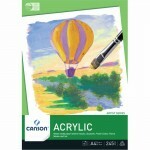 15 sheet.Canson's range of New Artists' Pads is one of the most extensive in the Australian market. This range of best selling pads is colour coded for ease-of-use for the consumer and are made to the highest quality while remaining cost competitive in the creative leisure market..
Acrylic Pad. A4. 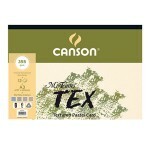 15 sheet.Canson's range of New Artists' Pads is one of the most extensive in the Australian market. This range of best selling pads is colour coded for ease-of-use for the consumer and are made to the highest quality while remaining cost competitive in the creative leisure market..
Canson Mi-Tiente 500 x 650mm sheet. 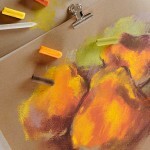 See the Colour Chart here The world’s most famous pastel paper, French-made Mi-Teintes has a pronounced texture. Mi-Teintes is a multi-use artist paper ideal for: pastel, charcoal, chalk, pencil, colour pencil, Conté crayon, gouache but also great for..
Canson Mi-Teintes 160gsm A3 pad 15 sheet. See the Colour Chart here The world’s most famous pastel paper, French-made Mi-Teintes has a pronounced texture. Mi-Teintes is a multi-use artist paper ideal for: pastel, charcoal, chalk, pencil, colour pencil, Conté crayon, gouache but also gre..
Canson Mi-Teintes 160gsm A4 pad 15 sheet. See the Colour Chart here The world’s most famous pastel paper, French-made Mi-Teintes has a pronounced texture. Mi-Teintes is a multi-use artist paper ideal for: pastel, charcoal, chalk, pencil, colour pencil, Conté crayon, gouache but also gre..
Canson Mi-Teintes 160gsm A5 pad 15 sheet. See the Colour Chart here The world’s most famous pastel paper, French-made Mi-Teintes has a pronounced texture. Mi-Teintes is a multi-use artist paper ideal for: pastel, charcoal, chalk, pencil, colour pencil, Conté crayon, gouache but also gre..
Mi-Teintes® TEX is a textured pastel card covered with a fine grit for laying down intense dry media colour. The very fine grit surface grips a deep layer of loose soft, dry colour and will hold it in place without the need for fixing.The 355gsm acid free card is unique. It has two different surface..
11"x14" - Acid free cartridge pads with black poly vinyl cover. 60 sheets/120 page. Double ring bindingThe ultimate visual arts record book, so much more than just a visual diary. Features large 24x32cm pages, two colour covers with personal identification panels, patented three flap storage pocke..
A2 - 100 sheet - Acid free cartridge pads with black poly vinyl cover. Double ring bindingThe ultimate visual arts record book, so much more than just a visual diary. Features large 24x32cm pages, two colour covers with personal identification panels, patented three flap storage pocket at back and..
A2 - Acid free cartridge pads with black poly vinyl cover. 60 sheets/120 page. Double ring bindingThe ultimate visual arts record book, so much more than just a visual diary. 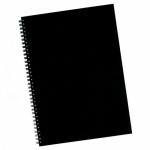 Features large 24x32cm pages, two colour covers with personal identification panels, patented three flap storage pocket at ..
A3 - Acid free cartridge pads with black poly vinyl cover. 60 sheets/120 page. Double ring bindingThe ultimate visual arts record book, so much more than just a visual diary. Features large 24x32cm pages, two colour covers with personal identification panels, patented three flap storage pocket at ..
A4 - Acid free cartridge pads with black poly vinyl cover. 60 sheets/120 page. Double ring binding. The ultimate visual arts record book, so much more than just a visual diary. ..
A5 - Acid free cartridge pads with black poly vinyl cover. 60 sheets/120 page. Double ring binding. The ultimate visual arts record book, so much more than just a visual diary. ..
A6 - Acid free cartridge pads with black poly vinyl cover. 60 sheets/120 page. Double ring bindingThe ultimate visual arts record book, so much more than just a visual diary. Features large 24x32cm pages, two colour covers with personal identification panels, patented three flap storage pocket at ..